Klout, the site that aims to measure your online influence, has made some big changes to its scoring system, and it has a new look to match the new algorithm. Founder and CEO Joe Fernandez says that the old Klout score looked at less than 100 “signals”, while the new one looks at more than 400. Put another way, he says the amount of data points that the company analyzes daily is expanding from 1 billion to 12 billion. For the first time, Klout is including measures of real-world influence in its scores — in other words, it’s looking for signs that you’re Kind Of A Big Deal offline, even if you don’t have hundreds of thousands of followers on Twitter. Those real-world data points include your Wikipedia page (if you’re cool enough to have one — I’m not) and your job title on LinkedIn. As an example of how the score is changing, Fernandez notes that Justin Bieber previously had a score of 100, while President Barack Obama had a score of 94. In the revamped system, Bieber is now at 91, while Obama is at 99. To be clear, Fernandez says “we still value online influence more than offline influence.” But by adding real-world data points into the mix, Klout gets a bit of “a safety net” that helps keep an important user’s score up even if they stop creating online content. In other words, it helps Klout avoid situations that might seem absurd to outside observers, like if President Obama’s score took a big dive simply because the frequency of his tweets went down. He also argues one way to stave off those complaints is to provide more transparency, which is one of the main goals of the redesigned Klout site and user profiles. When Fernandez says “transparency”, he doesn’t mean providing lots of graphs and charts showing off changes to your score — that’s still part of the site, but he says his goal is to turn a Klout profile into more of a “social resume,” with an emphasis on individual moments and updates. 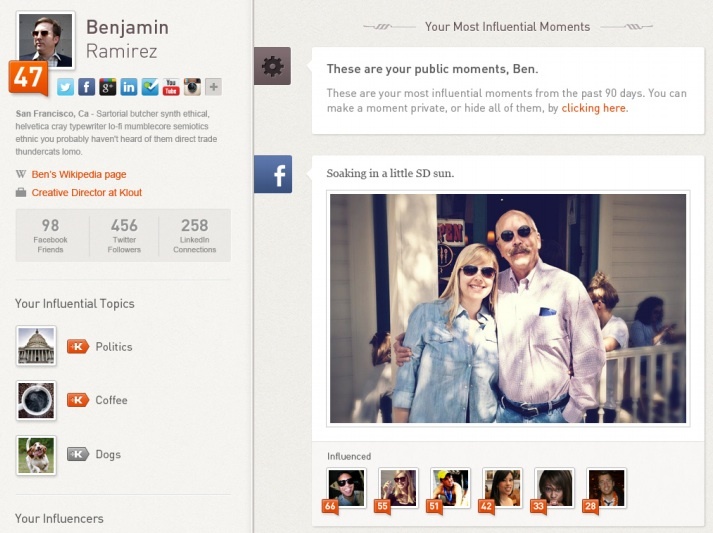 In practice, that means Klout profiles look a lot more like profiles on other social networking sites. When you look at your own profile, you’ll see a timeline of your social network updates and whether they’re “influencing” other users. When you look at someone else’s profile, you see their most “influential moments” — Fernandez says that means it’s less about judging someone with a number and more about capturing what kind of person they are online, and whether you might, say, want to follow them on Twitter. “For the first time, we’re really showing off the value to consumers,” Fernandez says.